Coming at you today to share something really exciting! There's a new food app in town called Food Monster by One Green Planet. I'm sure you're familiar with One Green Planet and their Food Monster page. If not, where have you been?! One Green Planet is my go-to for all things in the realm of conscious living. It's a collection of knowledge and entertainment from various contributors around the world. Their Food Monster page is a huge collection of vegan recipes and how to guides on all things plant based. It's now going to be easier than ever to interact with One Green Planet's Food Monster content because it's all going to be on the new Food Monster app! The Food Monster app is officially going to be released April 22, Earth Day! There's no better way to celebrate Earth Day than by making yourself a delicious vegan recipe from the Food Monster app! If you want to download the app before Friday, follow this link and check it out before it's released. The app is only for iPhone users right now, but it'll be available to Android customers later this year! I've had the chance to check the app out and already am loving it so much that I had to share it with you guys. There are over 5,000 recipes available and 100+ categories to search. Each recipe has a beautiful photo along with details on how to prepare the food. There's also a discussion panel on each recipe to share your thoughts and connect with others who have also tried the recipe out. I'm all about connecting with like minded individuals and the discussion panel on the recipes will give us all the chance to know what to expect from each recipe before the ingredients even enter your kitchen. I love that! You also have the option to "search" for literally anything that you desire whether it's french fries, pineapple guacamole, or fried chicken. You name it, there's probably a recipe for it! Tonight I've been browsing the seasonal Spring recipes for some ideas of what to make for an upcoming picnic. One of my favorite features on the app is that you can search by ingredient. If you have a tomato that you really need to use but aren't sure how to use it then all you have to do is search for that ingredient. All of the recipes including tomatoes will pop up. Problem solved! Check out the video to get a true sneak peek of what all the app has in store and then click here and download it! The app has so much to offer and gives you access to it all at the tip of your fingers. It's a fun way to spice up your cooking skills and connect with others who are into creating tasty plant based foods through a sleek, easy to use app. Let me know what you think of it and share with me the best recipes that you come across! Happy recipe hunting! Hey, hey, hey! Coming at you today from Starbucks. Do you ever feel like you can get a lot more work done sitting in a coffee shop and not at your house? That's totally how I feel and it's a definite fact that I am so much more productive out in public verses chilling in my bed. This would be all fine and dandy if I actually had a coffee shop to go hang out in. But no such thing exists in my town. Crazy, right?! Starbucks is about 45 minutes away and today I only worked a half day at my "real" job so I decided to come hang out here for the afternoon. It's nice! Anyways, on to more important things like this chocolate layer cake. Raw, vegan, gluten free; the whole works. I've realized that a lot of my recipes are raw which would give you the idea that I'm into that type of thing. And I totally am, but not as much as it seems. I eat a lot of smoothies and stuff but other than that I eat mostly cooked food. Isn't it funny how things can be portrayed on the internet? Things usually aren't what they seem. Scrolling through social media and seeing perfect pictures is filtered content that the artist only wants you to see. You don't see the whole story and I think that's important to remember. For example, here you see a picture of some rockin' vegan cake. What you don't see is the messy kitchen with a sink full of dishes or the bags of "props" (hemp seeds, pomegranate, cacao powder) sitting right out of sight. I guess my point is to let social media uplift you and inspire you. I want you to look at this cake and think about how you can make an awesome cake just like this one or maybe persuade a friend to try it out because you're trying to get them to eat a bit healthier. I don't want people to view my content and feel anything but positivity and inspiration. Even though the pictures I share are the whole story, they're a part of the story that I want you to be able to take away something good from. I was going to talk about this chocolate cake, but that rant too me to other places. So let's just move on to that recipe. Blend together ingredients until a dough forms. Place between parchment paper and roll out until about 2 inches thick. With a large circular cookie cutter cut out two layers of the base. Set aside. Blend together all ingredients until smooth. Spread a large amount of icing on top of both base pieces. Stack them. 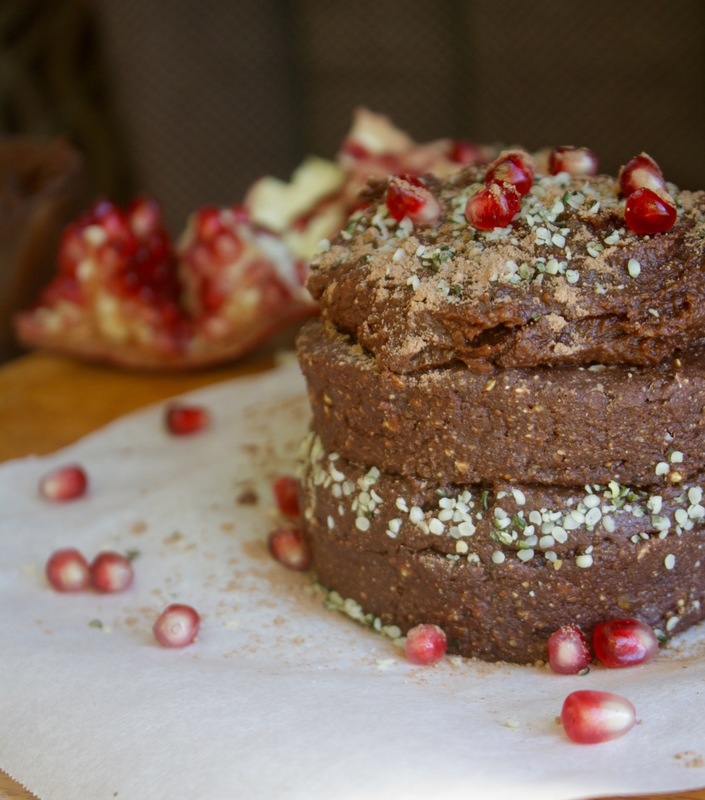 Top with cacao powder, pomegranate seeds, hemp seeds, or whatever you desire! Store in refrigerator for up to 7 days. You might have extra batter which is a great addition to banana ice cream or a smoothie! Something really cool happened yesterday. Well actually you might not even think it's that cool, but it makes me excited so I'm going to share it anyways. I had a huge realization of how much I love this website and everything I created involving it. You'd think that this would be a clear and obvious thing for me. But it's been no secret that I've been confused and in a weird place with what I'm doing on here for quite a while. I've been evolving and transforming and along with that is coming this new realization about how much I freaking love Create N Plate. I really do. There have been many times where I've found myself wanting to delete it all and just disappear from the internet. I've told Darrin this multiple times and each time he tells me not to do it. So I didn't. I don't know why, I just listened to him and kept doing my thing. Then a few weeks ago I was telling my friend about my feelings and he said, "Why do you want to delete it? What makes you feel that way?" Those two questions made me stop and think. I didn't answer him right away because I wasn't sure what to say. I thought about it and then we talked about it. That night I realized that I don't want to throw this all away and that's the reason why I never deleted anything in the first place. So yesterday I went into the kitchen to make a rawnola recipe. I've never attempted rawnola before but that's a good thing. Trying something different. I like doing that. I created (and perfected) an awesome rawnola recipe. I set up and had a rawnola photoshoot just like I've done for all of the recipes before. But this time was different than usual. This time I had fun. I enjoyed it. A lot. It felt like it did back when I first started Create N Plate. I loved it so much in the beginning. I was so excited about it that I'd tell everyone I came across to check out my site. I was proud of my work. Since the beginning though something shifted. I don't know what exactly. I think I just started focusing on the wrong things and lost touch with why I really love doing this. I'm coming around though and reigniting that flame once again, the flame that burned so fiercely for my love and desire to create awesome vegan recipes and an overall positive, uplifting website. It's happening and I am feeling so awesome about it all. Maybe you can tell by how much I've written on this simple rawnola recipe. It's all great though; the sun shining through my window, my reignited Create N Plate flame, the endless possibilities of a new day, and of course this rawnola recipe. But that's enough for now. Let's move on to the pumpkin spice rawnola that has brought you here in the first place. Blend together oats, shredded coconut, coconut sugar, and pumpkin pie spice. Add in dates and pulse until the mixture starts binding together. Serve, enjoy! Store in refrigerator for up to 7 days. I'm at it again, making drink recipes. It's my favorite thing to make. I should start a separate blog just dedicated to drink recipes. I came home from work this morning and I wanted to go for a run but I was too hungry. I can't run when I'm hungry. It just doesn't work well for me. I snacked on some pineapple but that didn't satisfy me so I made this milkshake recipe. When you eat plants you are able to have a milkshake for lunch any day you want because it'll leave you feeling energized and happy unlike an animal product filled milkshake that will leave you feeling tired and gross. Plants can do magical things! Like bring us this caramel apple milkshake. Yeah it's a bit chilly outside here. But the sun is shining today so a milkshake didn't leave me feeling too cold. Lets be honest though, it'll me the middle of January and I'll still be sipping on my favorite smoothies and cold drinks. Just can't get enough! For this milkshake I used some of this cinnamon horchata that I found at Whole Foods. I definitely recommend checking it out of you can find it in your area! If you can't find it though or just aren't interested then I have some alternative suggestions listed below! 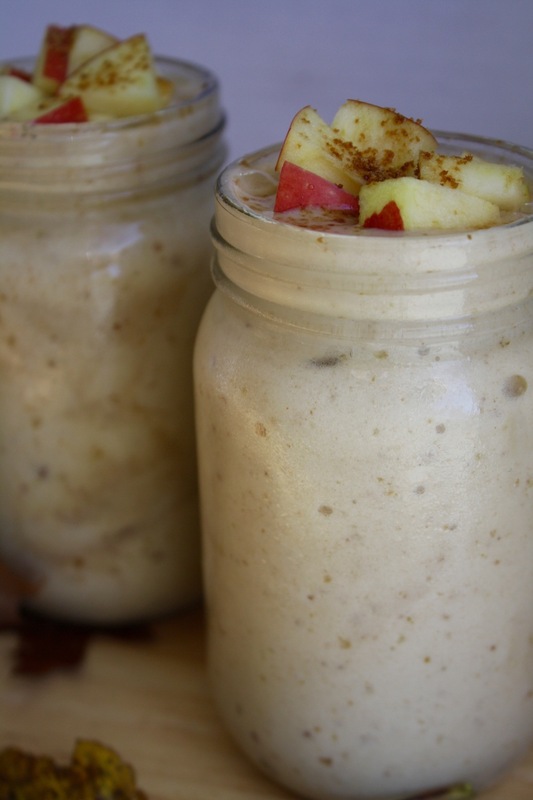 In a high speed blender, blend together bananas, cinnamon horchata, dates and 1 apple until smooth. 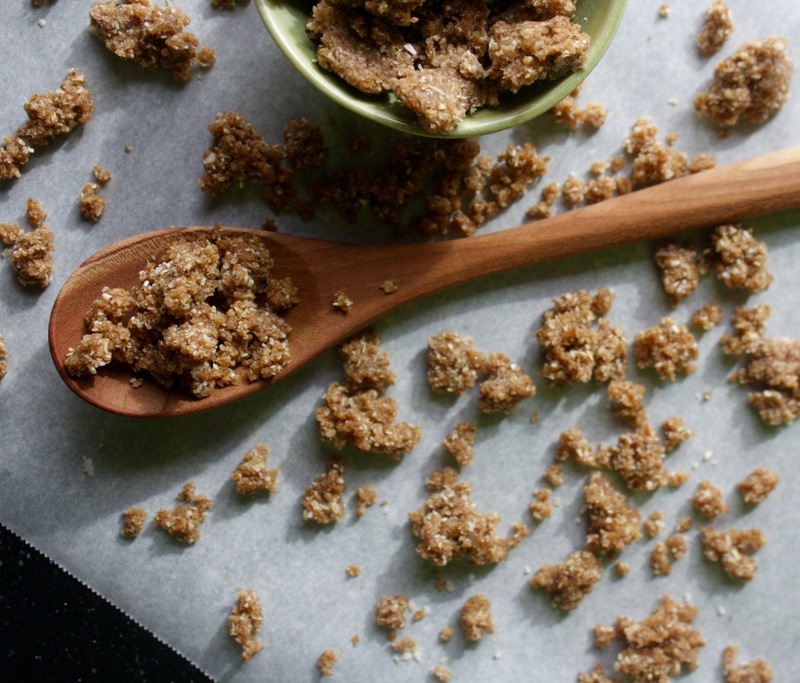 Pour into glasses and top with remaining apple, diced, and a bit of coconut sugar. Serve, enjoy! I feel like every few months I make a similar version of these cookies and share them here. Right before posting them I question it because I'm always paranoid that people will become bored with a similar recipe being posted over and over. Then I'm like oh well! These cookies are freaking awesome and I love them. So here they are, again. Not exactly the same as last time or the time before but similar and still delicious. 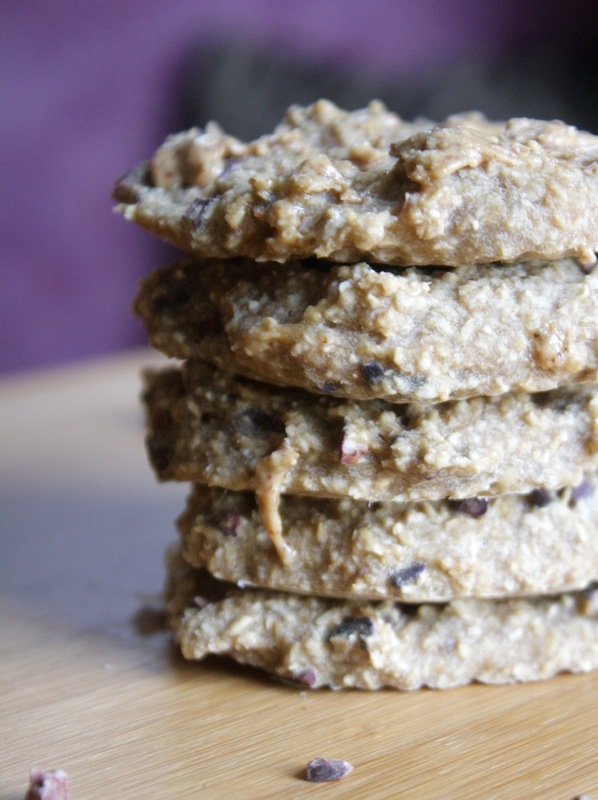 I love these cookies for a quick snack but they could easily be pared with some almond milk for an easy breakfast too! Cookies for breakfast?! I'm down for that. Preheat oven to 350 degrees. Blend or mash bananas to a smooth consistency. In a medium bowl mix together bananas, oat flour, chocolate chips, and coconut sugar. Spoon mixture onto parchment paper lined baking sheets. Bake for 10 minutes. Remove from oven. Top with almond butter and more chocolate chips if desired. Serve, enjoy!